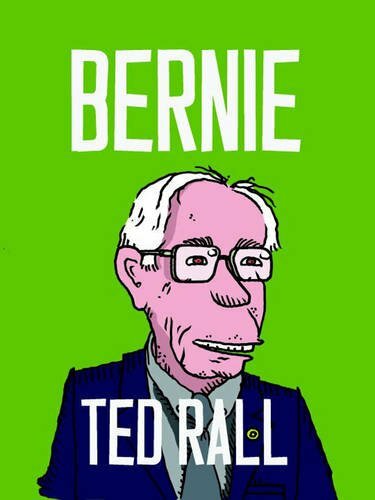 If you have to obsess over a political candidate who’s ocassionally allowed on television, please do so with Ted Rall’s book on Bernie. This is not John Nichols’ interview of Bernie in which he forgets that foreign policy even exists. This is not Jonathan Tasini’s almost worshipful book in which he selectively includes the best and omits the worst of Bernie Sanders’ record. And this is not even just an honest look at the facts about Bernie (which Rall sees as far more positive than negative). What sets this book apart is not that it’s a cartoon, but that it’s an argument for placing Bernie Sanders in a particular position in U.S. history, namely as the restoration of liberalism to a Democratic Party that hasn’t seen it since the McGovern campaign. In fact, a huge chunk of the book is not about Bernie at all, but is a history of the rightward drifting of the Democratic Party over the decades. Another big chunk is a history of Bernie’s childhood and career. Both of these sections are well done. Then comes the “Return of the Democratic Left,” the supposed rebirth of leftism within the Democratic Party. Rall suggests this as a possibility, but I’m pretty sure he finds it quite a bit more likely than I do. Rall says that in order to win, Bernie has to create the impression that he can win. Well, of course, in a certain sense he could. Polls show him defeating Trump, for whatever polls are worth, and defeating him by more than Hillary Clinton would. But is that what Bernie has to do to win? I should think he would have to convince the media gatekeepers that he favors corporate power, that he would have to win over the corrupt super-delegates, that he or a team of lawyers or a movement of activists would have to clean out the bureaucracy of the corrupt Democratic National Committee. I remain convinced that the media is keeping Sanders and Trump around for ratings and will destroy them as soon as it chooses, and never chooses to do such a thing as early as the December of the year before the election. In part, I attribute a lot more power to the media in general than Rall may. He tells the story of the rise and fall of Occupy without mentioning the media that fundamentally created it and largely destroyed it. I also am of course aware that history is not quite as simple as a fairy tale. “Here for the first time in 40 years was a candidate running for the Democratic nomination who was talking about bread and butter issues,” writes Rall of Sanders. But such candidates have of course existed. The year 2004 doesn’t make it into Rall’s history, or the name John Kerry, but in that year I worked for the campaign of Dennis Kucinich who also ran in 2008. His campaigns failed badly, but Jesse Jackson’s campaign of 1984 won more states than Sanders has yet won. The U.S. government mostly produces weapons and wars. Militarism is at least half of discretionary spending every year. Rall honestly notes various wars that Bernie has supported. But neither Rall nor anyone else has the slightest idea whether Sanders thinks military spending should stay at 50% of the budget, drop to 5%, or rise to 90%. Such basic policy questions are not asked. Most serious political change has never come through elections; it has come through popular movements that influence or overwhelm whoever happens to hold power. If Bernie is tossed under the bus by the caucus and primary voters, in predictable obedience to their televisions, the cause of saving the earth will not be lost. You will not be required to go into deep mourning. An interesting distraction will have been set aside, nothing more. Understanding all of that, it’d certainly be better for Bernie to win than any of the other Democrats and Republicans. And it would mean the sort of Rooseveltian transformation of the Democratic Party that Rall sees coming.